Request an estimate about your water damaged painting from leading art conservator in Kansas City and beyond, Peggy Van Witt. This fox hunt was spoiled by a house fire and subsequent water damage when the sheet rock deteriorated from the fire hoses. 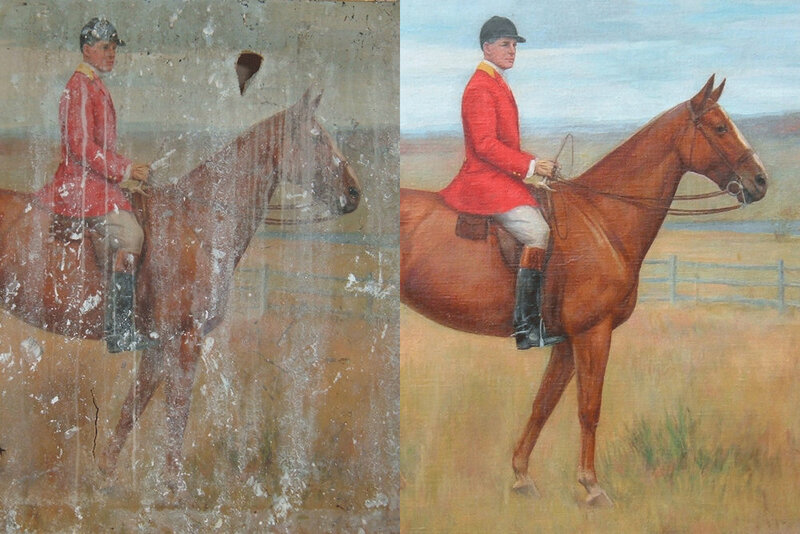 Fortunately, we were able to clean and restore this badly damaged painting. This portrait suffered water and mold damage. We cleaned all the mold and replaced the paint, which had been eaten away by the mold. This painting has sustained water and mold damage. The mold has eaten away the pigment on the canvas. We were able to restore and stabilize this painting. This watercolor survived a house fire, but was badly undulated from water damage and soot. The art was cleaned, flattened, and provide a conservation grade matte and backing board. Wedding photos are an especially tough thing to lose. We can digitally restore many photos which have been sitting in a wet basement and have grown discolored or moldy over the years. Sometimes, well-meaning people can damage their own painting by trying to wipe it clean with a damp cloth. The results are usually a disaster. If your paining needs to be cleaned, bring it to us. Van Witt’s conservation and restoration trained professionals offer immediate response to incidents involving water and water-related damage, including hurricanes, floods or related disasters. We will work with you, your insurance company or disaster response team to streamline communication and recover the damaged art without delay. During more than 50 years in the conservation field, our team has restored thousands of art pieces damaged by water and other disasters. Our emergency response, protocols and restoration practices fully align with American Institute for Conservation (AIC) guidelines. NOTE: IF YOU’VE EXPERIENCED A WATER-RELATED DISASTER AND HAVE DAMAGED ART, THESE WORKS MUST BE TREATED AS SOON AS POSSIBLE BY CONSERVATORS TRAINED IN EMERGENCY RESPONSE. Do not touch or wipe the art, whether painting, murals, sculptures or other objects. In addition, the longer the art stays wet, the greater potential for mold and other permanent damage. If a fire has also been involved, soot and ash can compound the potential for long-term loss. Some of our emergency response clients include National Catastrophe Restoration, Inc., a global leader in disaster restoration, Service Master and Steamatic. Should disaster strike, contact Van Witt Fine Art Conservation. We’re here. We’re ready.